After getting positive feedback for my Betta Fish Series, I’ve decided to do another series. And this time, it will be focusing on Goldfish. This first post will be an overview and summary of the whole series where I’ll share some facts which I’ll elaborate more in the next few post. Well, goldfish are the most popular (arguably) pet fish and their history dates back to hundreds of years ago in China and Japan where they are still considered luck bearers. 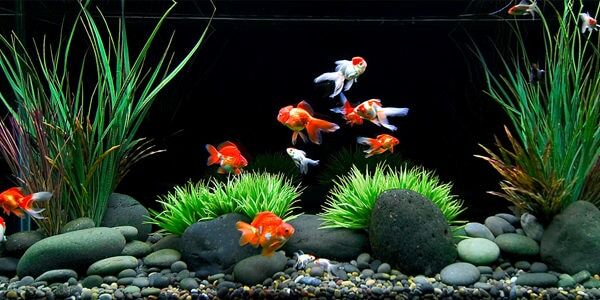 For the longest time that goldfish are kept as pet, they have been kept in small bowls or tanks. The idea that you can get a goldfish and place them in a bowl on your table is still prevalent today – unfortunately. This has led to poor living conditions, as well as a very short lifespan. If well maintained, goldfish can live up to 30 years and some varieties grow up to 12 inches long or more. The minimum size for a single goldfish varies for different type of goldfish. A fancy goldfish needs at least a 30 gallons aquarium with 10 extra gallons for every extra fish. Single tail goldfish needs a bigger size tank of minimum 55 gallons (ideally 75 because of the footprint) for the first and extra 20 gallons for each additional goldfish. As you can see, goldfish requires a lot of space and due to some type of goldfish being a schooling fish, the ideal situation would be to have them in a pond instead of a tank. But if you can’t have a pond in your home, try to give them as much of a space as possible. And definitely not in small bowls where ammonia will quickly build up, shortening your goldfish’s lifespan. Providing a nice, natural-looking setup with plants, rocks, or pieces of driftwood on the tank floor will give your goldfish new opportunities to explore. However, be careful not to use sharp-edged decorations, as they can hurt their fins or eyes. You can use either artificial or live plants or both together, but live plants have a great advantage of acting as natural water filters. Use thick-leaved plants also, as your goldfish love to nip at plants. Goldfish are cold-water fish, which means they do best in temperatures of 64.4-75.2 degrees Fahrenheit. Common goldfish and other hardy varieties may even thrive in a pond, but be careful with sudden temperature drops during winter. Your goldfish are omnivores, needing both meaty foods and plant matter in order to thrive and stay healthy. You can feed them commercial, processed pellets or flakes on a daily basis, but their diet should always be balanced and varied. Protein supplements like brine shrimp, daphnia, or live worms are a wonderful addition to their diet. Be careful though not to feed them too much protein as some, like brine shrimp, have a very high protein content. Vegetables such as lettuce, peas, or broccoli are necessary for extra vitamins. Find out more about feeding your goldfish the right way. If the tank or pond is well maintained and the fish are fed correctly, diseases and infections are highly preventable. Usually, the same diseases that most freshwater fish contract might affect your goldfish. These include Ich, parasitic infections, bacterial or fungal infections, or protozoa. Bad water conditions may affect their immune system by stressing them and making them more vulnerable to disease. If you notice only one or a few sick fish, it may be best to treat them in a hospital tank to isolate them and the disease as well. However, if you see all or most of the fish become ill, it’s best to give treatments in the main tank and make regular water changes. Find out more about different types of goldfish diseases. They are usually very peaceful and social fish and unless in an overcrowded tank or in high competition for food, they will rarely become aggressive. 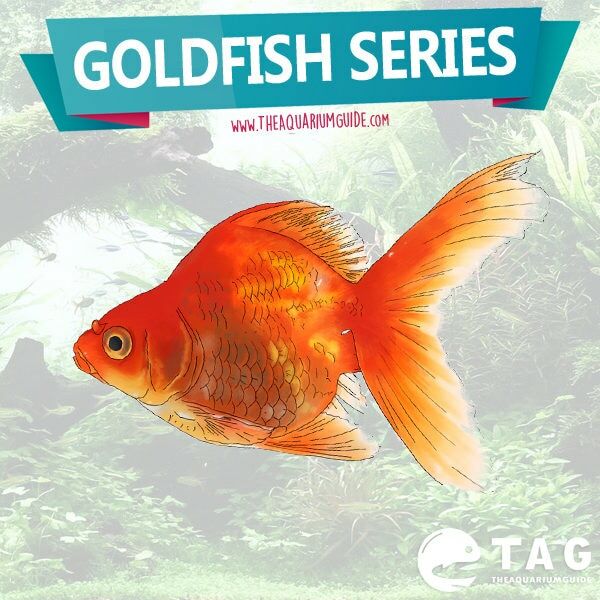 A normal behavior of goldfish is chasing, which is a mating behavior. Hovering at the top of the tank is also common, but if all the fish are hovering for long periods, this may be a sign of low oxygen levels. They like to graze and nibble on the plants in their tank, so you might consider placing thick leaved live plants or artificial ones in order to maintain the setup and avoid aggressive behavior. Usually it’s best to keep your fish together with other goldfish with the same tank requirements. For example, common goldfish may be kept with comet or fantail varieties, but not with the Ranchu or Oranda, as they need warmer water and are more delicate in general. Other suitable tank mates are usually cold-water fish of the approximate same size like the Paradise fish or the Pumpkinseed (Lepomis Gibbosus). Breeding your goldfish is a pretty tricky task, as they need very special conditions for breeding. In the wild, they spawn during springtime, so you need to replicate this season to let them know it’s time for breeding. This may take a while, as you need to keep water at a low temperature (between 50-54 degrees) for a couple of weeks and then slowly increase it, to simulate spring. The temperature should reach about 68 degrees minimum for spawning to begin. Find out more about the proper way to breed your goldfish. Also, you must begin feeding them high-quality food, such as live worms or brine shrimp, for extra nutrients to support healthy spawning. When you notice the male displaying white “pimples” on its fins and gills and the female become a little rounder, then you know they will soon spawn. The male will begin to chase the female until she finally lays her eggs on wide leaves or in the spawning mop. Next, the male will fertilize them by spraying milt over them. The fry should hatch in about 4-7 days and become free swimming a couple of days later. Learn the proper way to care for your goldfish. Don’t make the same mistake most beginners do by buying one to live in a small bowl to place on your desk. Place more of them in a large enough tank and you will enjoy these beautiful fish for decades. Share with us your goldfish experience by commenting below or via our facebook page.